Rick Ross’s dedication to conspicuous consumption remains steadfast. As his taste in beats becomes more varied and refined, his materialism becomes more unapologetic. The frustration that his critics feel seems to be a driving force behind his music. Nothing delights a true player more than knowing that his consistent success infuriates haters. With the video for “Ashes to Ashes”, Ross continues to thumb his nose at his detractors while enjoying all the indulgences his riches can provide. During the opening credits, Ross takes leisurely pulls from a blunt and taps the ashes into an ashtray. He sits on a couch in an apartment, surrounded by various designer bags bearing expensive name brands. The clip establishes a consistent visual motif early on, repeatedly showing Ross emitting thick clouds of weed smoke from his mouth like a chimney. The locale shifts to Beverly Hills, where Ross plays sugar daddy to the very lovely Elise Neal while she goes on a shopping spree. In its closing moments, the clip makes an allusion to Ross’s darker side with a quote that reads more like a threat. For a video that basks in the high life, “Ashes to Ashes” is a decidedly low tech affair. It was shot with an HD camera and features no stylistic touches save for a few shots rendered in slow motion. The concept is very basic, and the video doesn’t really tell a story so much as it establishes a situation. The images of expensive clothing and accessories, coupled with the feeling of the music, are all this video is about. The track, which was produced by Nasty Beat Makers, is basically a riff on Curtis Mayfield’s immortal "Give Me Your Love (Love Song)" from the Super Fly soundtrack. Here, that undeniable groove adds a bit of emotion to Ross’s daydreams of tricking and high living. He continues to sell the idea that that there is something inherently deep or meaningful about living lavishly. The video and song are pleasing to the eyes and ears, but the feeling dissipates like a sugar high once it’s all over. Rick Ross remains a solid yet overrated rapper with an impeccable ear for beats. His vocals and mannerisms suggest something much more thoughtful is going on beneath the surface. The lushness of his production adds to that effect. Alas, it’s only smoke and mirrors. While Ross’s technical prowess as an artist cannot be denied, his clichéd and shallow content deadens the impact of his music a bit. Hip-Hop has been courting the high life for a very long time, and such aspirations are now par for the course. The song and video are good for what they are, but lavish daydreams are hardly substantial in and of themselves. 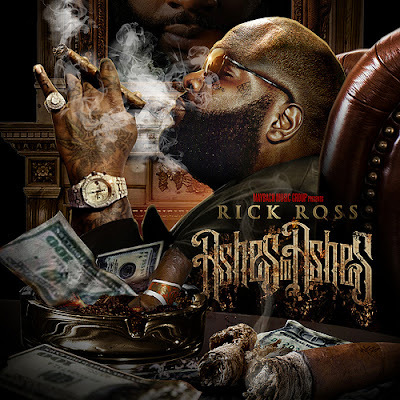 RICK ROSS 'ASHES TO ASHES' STARRING ELISE NEAL from DRE FILMS / MAYBACH FILMS on Vimeo.